I know you're wondering, what is S.I.S. Well, S.I.S. is our little program to keep kids in school. Get it? 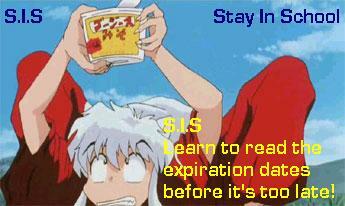 S.I.S.--Stay In School. Anyway, in S.I.S. 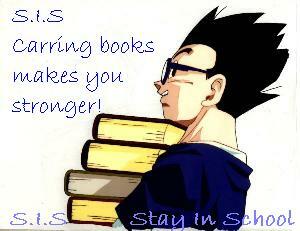 you will find pics we made with the DBZ and IY characters promoting school. Trust me, this makes sense. Since our website theme is school life, promoting school was just want we needed. You, too, can help us promote S.I.S. 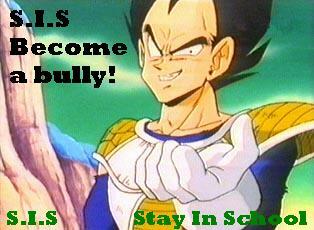 Just send your pic promoting S.I.S. to: mailto:megami-sama@email.com. Please write in the subject: Promoting S.I.S. 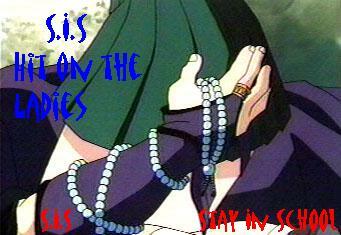 The above four S.I.S promotions were by Ammy and Megami-sama. Any pictures you see here are made by their respected owners. Don't steal! Stealing is bad!